We all know about the Nokia P1 that is supposed to be the upcoming high-end premium device from the company. Most importantly, sources claim that this will feature the latest Snapdragon 835 processor. Today, we got something that confirms the existence of such smartphone from Nokia. And it is to be mentioned that the company officially confirmed this. As we know, Nokia 6 has been launched exclusively only in China. 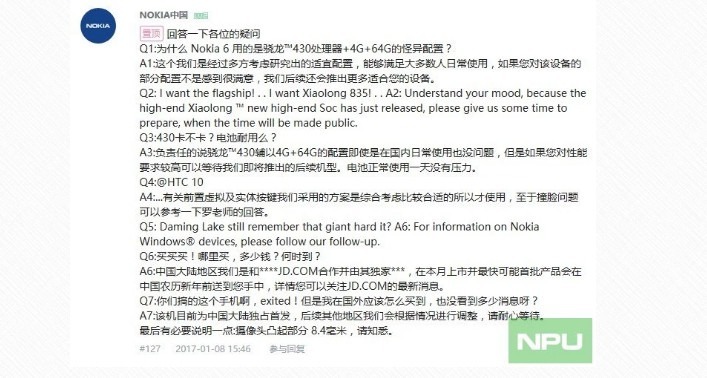 Also, Chinese social media platform, Weibo has been a source of a lot of Nokia related leaks that most of the time turned out to be true. This time, it is not a leak but the official statement about a Snapdragon 835 phone from the company’s official Weibo page. Some fans asked Nokia on Weibo about a Snapdragon 835 Phone and well, the company didn’t hesitate to reveal that they are working on one. But, along with this, the company also said that they are still working on it and need some time before it is made official. So, the chances are that MWC is not going to be the event for the launch of Nokia’s Snapdragon 835 phone. Just a couple of weeks ago, we heard news and leaks about the Nokia 8 which were further denied by Qualcomm itself. But now, since we have got the confirmation from the company, it seems this year is surely going to be the year of Nokia with the Nokia 6 already being launched and more devices yet to come. What are your opinions? Do let us know via the comments section. Stay tuned for more updates.